. crunchy honey almond roasted chickpeas . - . running with spoons . Spread chickpeas out onto prepared baking sheet and use a paper towel to pat them dry. You want to be sure to get as much moisture off as you can. The drier they are, the crunchier they'll be. In a medium sized mixing bowl, add almond butter, honey, and sugar, mixing well to ensure that everything is well combined. Add chickpeas to mixing bowl and use a spatula to ensure that they are evenly coated with the almond butter and honey mixture. Pour them back onto the baking sheet and sprinkle with salt. Bake for ~30 minutes, or until chickpeas are crunchy and no longer soft in the middle. Use a spatula to stir them every 10 minutes or so to make sure they don't burn. When fully cooled, store in an airtight container at room temperature. Have you ever tried roasted chickpeas? What’s one of your current favourite snacks? « . as we speak… in the mountains [again] . Again another fabulous recipe from you! I love this so much. I’m at my parents caring for my Mom post surgery. I’m running to the store today to get chickpeas to try this. yum!! these look absolutely fantastic!! I have been meaning to roast chickpeas for a while now. I am going to try to do this soon! Oh my goodness these look good. I have never tried to roast chick peas, but if I do this will be the recipe I go to. I love chips, but don’t eat a lot of them for obvious reasons so I need a crunchy snack that can hold me over between the days I do eat my chips! They really are the a wonderful little crunchy snack, especially when you start playing around with flavour combos! I randomly go through phases with roasted chick peas- obviously with peanut butter in place of almond. So delicious especially when roasted along side some carrots and/or sweet potatoes coated in the same flavors. I love chickpeas!!! But I haven’t tried them roasted… yet! These look great hun! Chick peas are the only beans I willingly eat haha, and I love them when they’re roasted 🙂 Never would have thought to use a nut butter on them…definitely making these this weekend! I am trying these this evening. My mouth is salivating already!! I have had roasted chickpeas before but they were savory/spicy. Roadside vendors in Sri Lanka sell them by the “paper cone” and they are usually roasted in chili, curry, coriander powders and oil…but your honey almond ones have piqued my curiosity! I have been nursing a slight honey almond butter addiction with some homemade honey A/B – now I might have to add these honey & A/B coated chickpeas to my rotation! Brilliant idea lady – Happy April fools day! Those sound like such a lovely snack! I’ve never had savoury ones before, but I’m thinking that’ll be the next batch I whip up. Happy April Fool’s to you too, lovely lady! Hopefully you manage to avoid getting pranked. Yum!!! I usually roast up Edamame, but these sound super good!! I need to give these a try! My favorite snack “back in the day” was pretzels and mustard haha I would just dip them right in, reminded me of the big soft ones. These look yummy! I’ve done the de-skinning…very relaxing zen-moment. Weird but true! I love making a chickpea mash or incorporating chickpeas into veggie burgers, but I don’t think I’ve ever had them roasted! I’ll have to give this a try! Back in the day I would snack on Pão de Queijo… have you heard of it? It is a veeeery common brazilian recipe, they are mini cheese buns made of tapioca flour… EVERY food place sells them here… really common to eat them for breakfast. My favourite snack right now is Quest Bar… I found a place here in Sao Paulo that sells them for a really fair price, so I no longer need to order from iherb and wait like 40 days for them to arrive 🙂 I’m a happy girl right now! I’ve never head of Pão de Queijo, but it sounds pretty amazing. And I can definitely relate to not being able to control myself around certain foods that I love, so don’t worry — you’re not the only one! Love chickpeas. Love crunchy chickpeas. Love ALL chickpeas really. I never peel the skins off though… are you judging me? It’s mostly because I’m lazy, though I imagine it would up the crunch factor so maybe I will next time. Hunn, it has to be said – you are getting more and more professional and genius with your food pics and recipes. I seriously think you should at least create a snack-book or a picture band if not an entire coffeeplace all over the world (alson in Switzerland, hint hint hint). 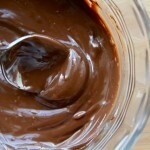 I am a hige fan of AB and honey – I can eat this by spoonflu out of a bowl! Can you believe I didn’t have ANY nutbutter in months except some hardened coconut butter?? The ordering is so expensive and since my first Ninja blender died, I couldn’t make my own. I SO await my new one to arrive so I can finally whip up new flavors – and coat chickpeas with it!! Ho-ly Frig. I bookmarked this and am going to make these this weekend. I LOVE roasted chick peas but I never thought to make them kind of sweet!!! GENIUS! I love chickpeas, they are so versatile! I love them roasted very similar to this with peanut butter and also savoury with a load of cumin, chilli powder and tumeric! I will have to give this almond butter combo a go 🙂 . My favourite snack is almond butter, honey and cinnamon on rice cakes – sooo good! Ha – I think it is slowly becoming my preferred nut butter 🙂 And that combo – I can see why you love it – heavenly! These look super yummy! I’ve never had chickpeas as snack but I’m thinking I need to add some to my diet. At first I wasn’t sold, but then I read your description and COME TO MAMA, BEANS! The combination of almond butter, honey and crunch sounds divine <3. Chickpeas are one of my favorite snacks, or meals for that matter. I usually like them salty, but will have to give this a go. Maybe it will calm my major sweet tooth! I added a touch of salt to these and it made them borderline dangerous. The sweet and salty combo is to.die.for. 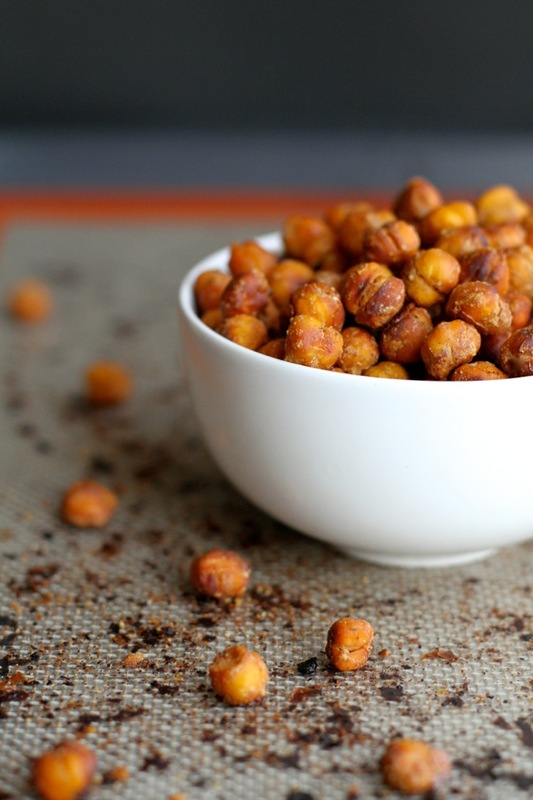 Roasted chickpeas are so amazing! I’ve made them only once before. I did find peeling them kind of annoying, but I think it was definitely worth it. 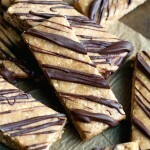 The ones I made were maple syrup based, but I love the addition of almond butter here. Looks delicious! I think your process for drying them sounds great. Oh. And these sound AMAZING. We make them frequently with taco – like seasoning for using in tacos, but they never got super crunchy. I think your drying process would help!!! 🙂 Happy Tuesday! ohhhh chickpeas how I love thee!!! Roasted and blended, I’ll take em any way I can! So funny — I specifically bought chickpeas at the store this week so I could roast them up for a snack! I’m definitely more of a salty snacker, but I’ve never seen a recipe for sweet roasted chickpeas before. You’re so smart ;). These almost remind me of kettle corn… That sweet & salty, ya know? I love popping roasted balls in my mouth as a quick snack (TWSS). ;oP But really, I love these snacks. I usually buy them, but I bet making them myself would be a lottttt cheaper. These days, my go-to snacks have been slivers of ALL the baked goods, jelly beans (tis the season), and squares of the new Endangered Species filled chocolate bars. Dying. My favorite “back in the day” snacks were probably Dunkaroos (Gosh, I want some so bad now!) and gushers! I love chickpeas, can’t believe I’ve never roasted them myself! Actually, I can, because I’m totally lazy. But these look pretty easy to do! This would definitely be a great recipe to try. I like chick peas a lot. Chickpeas are such a great source of protein and I love them roasted like this. Fab recipe! These sound so good! I keep saying that I need to try to make roast chick peas again. I think my issue might have been not drying them well enough in the past. I like the addition of almond butter too! 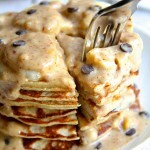 your recipes always make me drool! perfect snack!! I LOVE roasted chickpeas! I will have to try this combo! I love crunchy roasted chickpeas! I’m in the process of creating my own recipe for them right now! And lentils are also really awesome to roast! Now that’s something I definitely would have never thought to try. Love the creativity! Those look incredibly delicious!!!!! I really want to try to make them! Ohhh how I have missed the beauty that is your blog!! I had some Amanda withdrawals being on vacation this past week! Can you just go ahead and come to Seattle, and bring this entire bowl with you?? HOLY YUM! I’ve bought The Good Bean snacks before, but they’re pricey so having an at-home version would be awesome! And thank you for sharing your keep-them-crunchy secrets…I was afraid that if I made them at home I would end up with mushy beans…so good to know! Back in the day snacks? Pop Tarts, Toasters Strudels, and those chocolate covered granola bars. Clearly, I was the epitome of health as a child. Current favourite snack? banana bread. I’m going to be sad when I run out…(but then I’ll just make another batch). 😆 You and me both. I would even bother heating Pop Tarts — I’d just eat them straight from the box with some milk. Did you say chickpeas? I may or may not have mentioned it before but I have a slight [read: serious] obsession with them. Roasted, in just about every lunch, in my yogurt bowls or straight from the can: I go through a lot of chickpeas. Luckily, my stomach has either gotten used to them or decided to play along. Naked chickpeas? Call it a chick-pea-p show ;). And don’t ask where those TWSS-needed thoughts are coming from. It must be all the sunshine we’ve been having lately. Talk about forgetting the most important part: I’ve only tried savoury [cumin being a favourite] but never sweet roasted chickpeas before and since almond butter is another food obsession of mine your recipe sounds heavenly. Though you might want to change the serving size to one 😉 . Pretty sure we just became best friends! These are pinned, can’t wait to make them! Thank you so much for this recipe , which I will be making tonight ! I will use coconut nectar instead of honey, lower gi index. Instead of peeling each one, do you think grabbing a bunch of them and rubbing the skins off in paper towels ? You could definitely grab bigger bunches of them and rub them together! It’s fine even if you miss a few here and there. Okay I’m SO glad you posted these instead of a prank. Honey almond is the bomb!! Love the honey AND granulated sugar–I bet that adds the most fab texture. Such a perfect snackity! Wowwww Amanda, this looks sooo scrumptious! I’ve seen so many roasted chickpea recipes but this is one of the very few that stand out to me. You should get royalties from almond butter companies btw, haha! You use it so much in your blog recipes that I’m sure they’ve become 100% more popular. 😀 I’m pinning this and hopefully making it soon! Yum…I love roasted chickpeas! I usually do something savory and coat them with something from Epicure Selections seasonings or dip mixes. And, I finally tried almond butter in my steel cut oats. Never. turning. back. Soooo good! Yum – this looks awesome!!! Umm…I didn’t know that chickpeas had skins that peeled off. I’ve always just dumped the can into whatever I’m making – oops!! Hehe I don’t think it makes a big difference unless you’re trying to get them crispy! I roasted some chickpeas for the first time a few weeks ago and I absolutely loved them! Even better, Hunter loved them too! Definitely trying your version out! totally my style! i like a little oomph too, nutty sweet deliriousness! I’m quite sure that I just fell in love. BUT because these look so amazing, I’ll do it. I’m actually surprised at how much I love roasted chickpeas! My homemade ones never turn out quite right (probably because of not drying them enough and not removing the skins hahaha) but I love The Good Bean brand. So addictive! Another delicious looking recipe! I’ve never roasted on chickpeas myself before but I have eaten them and loved them. Favourite back in the day snack is probably lots and lots of cheese and biscuits! Only you could make a silpat look pretty!!! Love the step by step photogsss! So do you think these can replace the popcorn I am currently snacking on. MY POPCORN ADDICTION IS GETTING OOC! These sound amazing! I never knew you could eat chickpeas like this. Honey and almonds – how could you not like that? Pinned! “If you would have told me a handful of years ago that there would come a day where I would enjoy snacking on beans, I would have laughed myself sick before going to grab a handful of Skittles.” Same here! Was that a clever little flatulence joke you squeaked in there at the end? Hmm, I think so. I made roasted chickpeas once a couple of years ago. They were awful, but they also didn’t have the great directions you do here or the wonderful flavor combo. Plus, I actually like beans. A lot, even with their musicality, so I’d be willing to give them another go. Spoons…This is so creepy. ‘Spill the beans’ and then suddenly see this recipe when I get home. 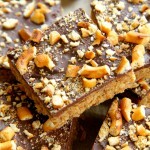 I am tempted to suffer a stomach terror for this recipe…sweet AND salty! I loved these battered versions of chickpeas as a kid! PS- Blog working on Safari, not on chrome or phone. Mmmm roasted chickpeas are one of my favorite snacks!! Making these tonight! I have yet to make anything with chickpeas besides hummus and just throwing them on a salad. I never remember how much I like roasted chickpeas until I’m actually eating them. So true about the skins – it’s a pain but actually totally worth it. I don’t even know what snacks I used to eat… grapes maybe? I wish I had a better memory, it’s terrible. 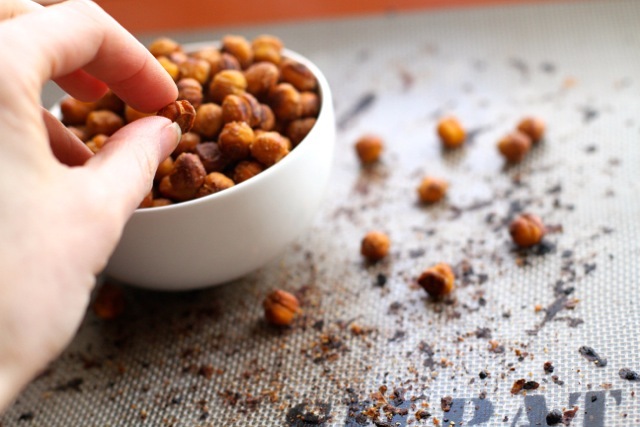 I’ve seriously had roasted chickpeas on my list of recipe ideas for MONTHS now! Ever since I fell in love with the pre-packaged cinnamon ones I found at TJ Maxx. Good to know about removing the skins…I wouldn’t have thought about that, but it makes total sense! And I agree, peeling chickpeas is definitely cathartic! Current favorite snack: Cold roasted sweet potato and coconut butter! “Back in the day” favorite snack: Cinnamon toast! These sound so fancy and delicious! All I can remember are those little debbie swiss rolls and the austin’s brand of the cracker + PB sandwiches. I know those were staples when I was little. And before the healthy eating sort of took over in my life, I am certain it was a lot of cheap chocolate and fruit snacks… Oh how things have changed! Yum! I’ve never tried a sweet version of chickpeas so I can’t wait to try these- they remind me of corn nuts from the gas station, ha…but without all the whack ingredients! I love these!! It has been a while since I made them but now I am going to be making them soon! I love making cinnamon sugar ones or just plain old salted ones. Oh I’m so happy you posted this! I love to eat chickpeas but no one else in my family does. I will be testing these out on my husband and little ones asap. 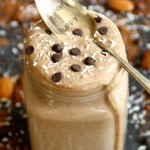 Gorgeous photos on your blog….and holy yum does this look good! I am pinning and stumbling. Happy #SitsSharefest Day! Wow- those look amazing! I’m visiting from SITS Sharefest. I am a sweet person but love a little sweet and salty together. This recipe sounds so good because it is just that! Thanks, pinned! I LOVE roasted chickpeas! I stick with a little salty, spicy combo, but have experimented with some sweet ones. Mine was sort of a fail, so I’m looking forward to trying this recipe! I’m always looking for healthier snack options. I’m definitely going to try these. I’ll come back and let you know how I like them. Looks delicious! Will definitely have to try this, as I love chickpeas. Please excuse if this was asked, I tried to look through all of the posts and hope i didn’t miss any. Anyway… I have several 5 pound bags (dried, non-cooked/processed) and wondering how I would prepare these from non-canned chickpeas. I have a pressure cooker and would prefer to use it – if possible for ease and time of things. I’m trying to find tasty, fun items that I can send in care packages overseas. Do you think if these area vacuum sealed they would last very long? thank you in advance to anyone that can help me with my questions. Just made these 10 minutes after seeing your blog post here and I’m now munching on them….Highly recommend everyone listens to you about drying them out as I was wanting them NOW…still good but not quite crispy enough. I tried these, and followed the directions. Peeled and well dried. I used peanut butter instead of almond, maybe that was part of the problem. Was hard to get pb to stick to the chickpeas, after stirring for about 20 minutes I gave up and plopped them onto a baking sheet. Baked and stirred and a few are crunchy, but most are just gloppy and soft. Hate to be the only fail, but I obviously messed something up. 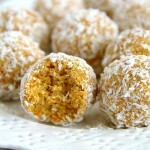 I just made these using cashew butter instead of Almond butter and they were AMAZING!! !